It's Monday in a Knitting Blog, bloglines. I love it when the cat can speak for me. She is actually doing the tongue thing because she does not have any bottom teeth in the front. Just the molars. So her tongue slips out from time to time. That is what I tell myself when I catch her looking at me with it out, anyway. 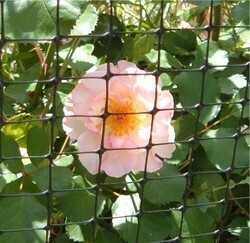 As you can see, not only do the roses live behind fencing*, but so does my elderly cat. No, not really. She was hanging out in her kitty condo that is something like this one only not as pricey and without the ladders and weird plastic shelves the other day and I had to take her picture. Her condo has two carpet covered shelves that she still enjoys napping on during the spring. Yes, only in the spring. No, I don't know why. Yes, I'm afraid to ask. Last Sunday, while watching Planet Earth with the cat, I knit the tiny socks*. 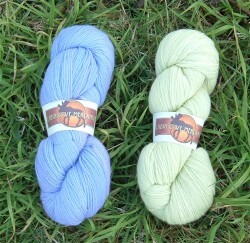 I used a double strand of KnitPicks Palette in Petal from my stash and 2.75 mm DPNs. I knit them very tightly, so they are very dense little socks. Yes, they were stress knitting. Thank you for noticing. I used some Lorna's Lace Shepard Sock yarn in the Purple Club color-way from the fabulous KnittyOtter. I think there may be enough yarn left for another pair of shortie type socks. Although, my LYS is now stocking Lorna's Lace in solids, so I may see if I can find a purple and use this for heels and toes. Not much of a pattern for these socks. I used a two by two rib and carried it down the foot with a short row heel and toe. I tried a heel flap because I like how they fit my foot, but did not like how the yarn was puddling. I like how these socks are alike, but not. Yes, I really am that weird. 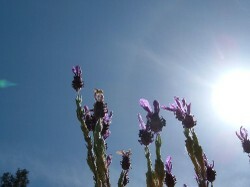 A sunny Saturday sky with a side of lavender, and unless I can find something else in bloom, that's the last photo in that style there will be for a while. It's been a fun couple of days over here. Yesterday, while taking photos of roses, I stepped on a piece of rose bush complete with thorns that I had failed to see and pick up when I was pruning. I am reminded of it every time I take a step. Last night, kitty had something she just had to tell me while I was knitting a pattern row on Kew Sock #1. 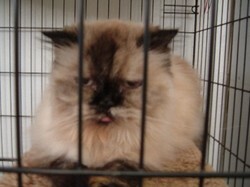 I had to tink and I am no longer speaking to kitty because it did not go well and it's all her fault. Photo tomorrow. This morning, after my shower, I managed to break a bottle of nail polish in my bathroom sink. My favorite one, of course. Now that I've put on shoes, my foot is hurting more and I have errands to run. However, since I am clearly DOOMED! I will be returning as soon as I can and taking my knitting to bed until the universe finds someone else to kick. Like a Baldwin brother or Mel or someone. Edited to Add: I'm a dumbass, who just lost an earring. Go wish the KnittyOtter a happy birthday! She's not back yet, but she's coming back... or so she said. o.0 She is the most kind-hearted, loving and supportive friend a nut like me could ever have. Yes, that was in question earlier in the week. I got thru it. Although, it wasn't pretty and I will never be taking my mother, who doesn't want to spend more than fifty cents on yarn for any project*, with me to my LYS again. Okay. Not really. I put up the deer fencing to keep the kitties out of the herb garden. It worked, however, now there are ground dwelling somethings living in the herb garden. I cannot win. It's a Lady of the Dawn rose should anyone care. The flowers don't last very long once they are cut, but they look lovely on the bush. The art department is currently on a well deserved vacation, so the button is still on hold. However, that does not mean that we have to wait to start knitting Kew... assuming we (I mean you, of course) still want to knit Kew. Have you seen the Magic 28 button in the sidebar? If you click on it and if I did the geek thing right, it will take you to the blog that Norma has set up for her Magic 28 Along. I think it's an Along... or is it a ring? I'm kind of hazy on all the details. I just know I agreed to join one night on my way to bed. I really need to avoid the computer while sleepy. If you haven't gone to look, go. 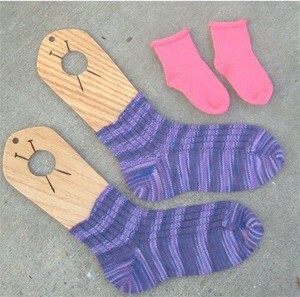 If you like knitting socks, think about joining. I don't think there's a due date on this project, they really are quick to knit, and it's another cool button for your sidebar. *Yes, I typed 'yearn' the first time. Shut up.